In 2018 our Life Readers’ group will begin with The Russian Revolution through Film. The course will provide an understanding of Russian culture and history of the first 20 years of the 20th century through the lens of Russian film, short fiction, and art. We will watch and discuss the following films: Sergei Eisenstein’s Battleship Potemkin (1925) and October: Ten Days That Shook the World (1928); Alexander Dovzhenko’s Earth (1930); Chapayev (1934), directed by the Vasiliev brothers; and Vladimir Motyl’s The White Sun of the Desert (1969). The following topics will be discussed in detail: What were the reasons for the Russian revolution? Why did the revolution find such enormous support within the country? How was it perceived in the West? Would it have been possible to prevent it? What went wrong after the revolution? What were the Civil War and War Communism? What was the role of propaganda during the Civil War? How do artists respond to and shape historical events? How did filmmakers, writers, and artists in the early 20th Russia transmute fear, violence, hopes, and chaos into art? How do utopian ideas and dreams transform into reality? Classes take place at the Arlington Heights Memorial Library. Click here for more information on viewing the films through the library’s Kanopy system. Lecture and discussion: Pre-revolutionary Russia under the Old Regime and Revolution of 1905. Watching and discussing Sergei Eisenstein’s Battleship Potemkin available on Kanopy. Lecture and discussion: World War 1, the February and October Revolutions in 1917. Watching and discussing Sergei Eisenstein’s October: Ten Days That Shook the World available on Kanopy. Lecture and discussion: The Civil War in Russia. Watching and discussing Chapayev directed by brothers Vasiliev and available on Kanopy. Lecture and discussion: The Revolution in the Village and Proletarian Art. 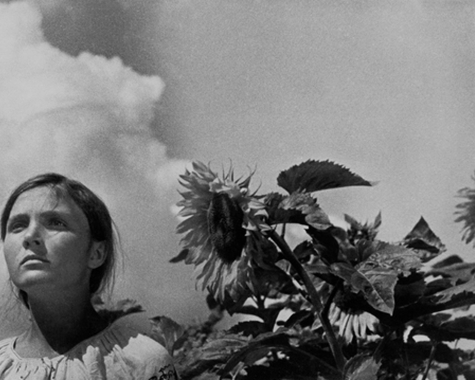 Watching and discussing Alexander Dovzhenko’s Earth available on Kanopy. Lecture and Discussion: The Red Terror, Cheka, the National Question, and Constructivism. Watching and discussing Motyl’s The White Sun of the Desert available on Kanopy.